You can give your living room a really modern look with the black and metallic colours of the furniture from Kmart Catalogue 31 Jan - 20 Feb 2019. Excellent choices, modern solutions for storage problems and updated prices by Kmart make shopping for your home easier. You can also find fine wooden masterpieces like timber occasional chair on pg 16. With an acceptable angle leaning backward, it looks a really comfortable piece of furniture for any corner of a house. Find a handsome solution for your storage problems based on clothing, shoes, personal care products or laundry. Kmart offers bamboo frames, bamboo frame racks, wooden laundry baskets, and everything look modern and cozy. As always, prices are irresistible and really cheaper compared to the regular stores. You can also improve your bathroom with metallic black and gray colours. Black is also fashionable in living rooms in my opinion. It reflects a fashion of the 2020s or basically the future. You can even find a marbled stone hallway table in this category. The catalogue has more of the black and wooden furniture and they are viewable on pg 24-25. Shop candles, tables, bookshelves, shoe racks which are perfectly matched together in a single room. 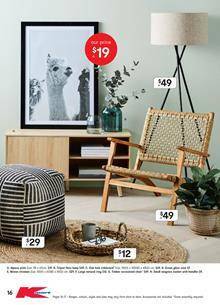 Customize and create your own style with the latest Kmart Catalogue home sale 31 Jan - 20 Feb.